Ever wonder how the shelves and stacks get populated with just the materials you need for your research? Here’s a look into a buying trip recently made by our very own South Asian Studies Librarian, Mara Thacker. She was one of the fist to participate in the University Library’s pilot program designed to allow librarians to travel overseas, seek relationships with vendors, and purchase materials to develop our collections here in Urbana-Champaign. This Q & A session reveals how we curate our library materials to better serve you. A special thanks goes out to the Center for South Asian and Middle Eastern Studies whose dedication to our library and regular support also made this project possible. What is a buying trip? Buying trips are exactly what they sound like—a trip, often overseas, for the purpose of purchasing books, films, and other materials for the library. Not all buying trips result in an immediate purchase but instead lay groundwork for a future acquisition or for a partnership to digitize materials so our community can access them. Are all library workers able to go on buying trees? Any library worker whose job responsibilities include collection development (in plainer language—buying books and other library resources) is eligible to go on a trip. These trips usually are targeting unique international materials which does exclude people who only buy materials from the U.S. At this point, mostly International and Area Studies Library faculty have taken advantage of the Library’s pilot program to fund buying trips, but the task force that is managing the pilot funding program is actively inviting other subject specialists with an interest in purchasing international materials to apply. Where did this trip take you? How do you select what sites you want to visit? In my most recent buying trip, I went to Delhi, Kolkata (Calcutta), and Bengaluru in India, and Dhaka, Bangladesh. I selected these sites based on a few factors. 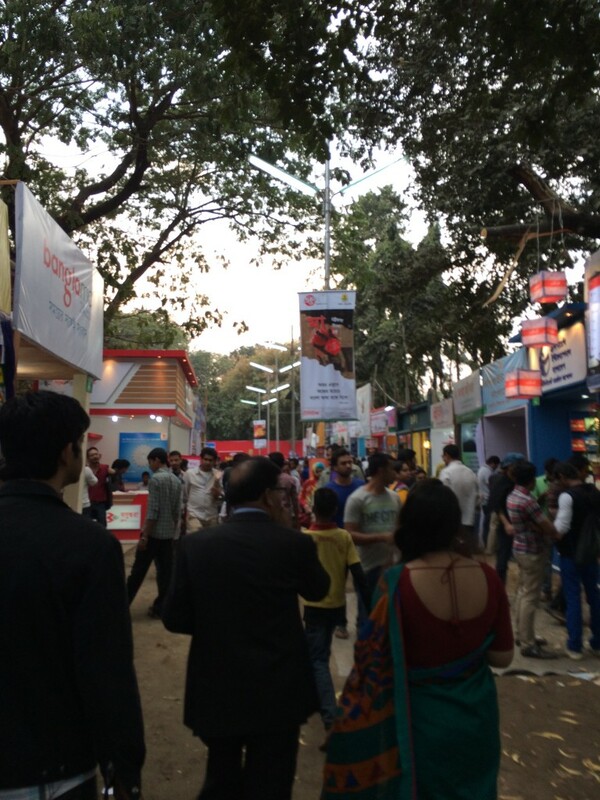 Delhi and Kolkata both had large book fairs that I planned to attend, but in addition to that, Delhi had two major vendors that I wanted to meet with, and Kolkata is the largest center for Bengali language publishing. Since Bengali language materials were one of collecting priorities, I also chose to go to Dhaka, Bangladesh. It was important to me to visit a South Asian country other than India because my subject specialization covers seven countries in total and I have been on five trips to India but not a single trip to one of the others. I later found out that I was the first U.S.-based librarian to visit Bangladesh for a buying trip in a long time so I’m really glad I chose to go there. Finally, I chose to visit Bengaluru because I had been in contact with a comic collector there who I wanted to meet with. This photo gives you an idea of the crowd at the very popular Ekushey Boi Mela book fair in Dhaka, Bangladesh. Are all buying trips international? For the purposes of the pilot funding program, yes. Can’t you just buy materials online? While it’s true that many materials are available online, not everything is easy to find online. Some international vendors are better than others in terms of having complete, easy-to-search websites. 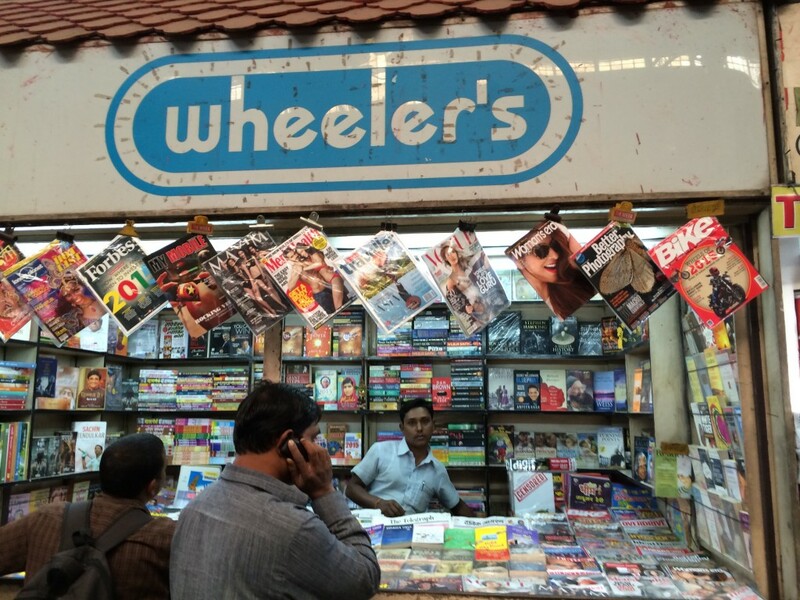 To illustrate my point, take the case of the comic collector in Bengaluru. I had been chatting with him over email off and on for more than a year but he was either unable or unwilling to give me a complete picture of all of his materials and how much he would charge for them. When I met with him, it turned out he had a lot more than I had been led to believe—much more than I could ever hope to buy in one trip! In the course of our conversation, he revealed that he had been reluctant to sell to me before because he didn’t know how credible our institution was or whether or not we would take proper care of the comics. Comics are his passion and he did not want the materials damaged, resold or thrown into some dusty corner. I explained to him my vision for the University of Illinois to have the most comprehensive comic collection in North America including rare titles that would be preserved in our Rare Books & Manuscripts Library. In the end, not only did I buy a pile of out-of-print Indrajal comics from him, he has now agreed to be a vendor and to sell to us directly. That said, I imagine I will want to visit him again in the future because he has piles and piles of comics, many of which are not cataloged. I’d like a few more days to sort through them and find some gems. Bookseller at Howrah Junction train station in Kolkata. These small stalls at transportation hubs in India are some of the only places where you can find vernacular language pulp fiction novels. What’s your budget for buying library materials? Do you go with a list in mind? Are there items that are “high priority” (censored items, rare items, limited publications, etc.)? These trips are generally meant to target materials that are difficult to acquire through normal collection channels, though the difficulty could range from “Oh, I didn’t know this existed” to “Only one copy exists in the entire world”. The challenge is that if materials are really rare and do not already have a record in the Online Computer Library Center (OCLC), they are going to require original cataloging and if they are fragile, they will require special processing. This can be expensive and time consuming and absolutely requires advance planning with technical services and cataloging. Prior to leaving on the trip, I emailed the UIUC faculty working in and on South Asian Studies to solicit both specific requests as well as general topical requests. I compiled these along with my own ideas into a list of collecting priorities and I printed out copies to take during the trip. I also emailed the list in advance to a few of the larger vendors who I had prescheduled meetings with. One special area I was targeting was comics for the South Asian comic collection. The comic collection really serves to distinguish our South Asian collection from other such collections and is an important contribution to the national collection. Right now, vendor coverage of South Asian comics is somewhat spotty so it takes a bit more work to build up these resources. 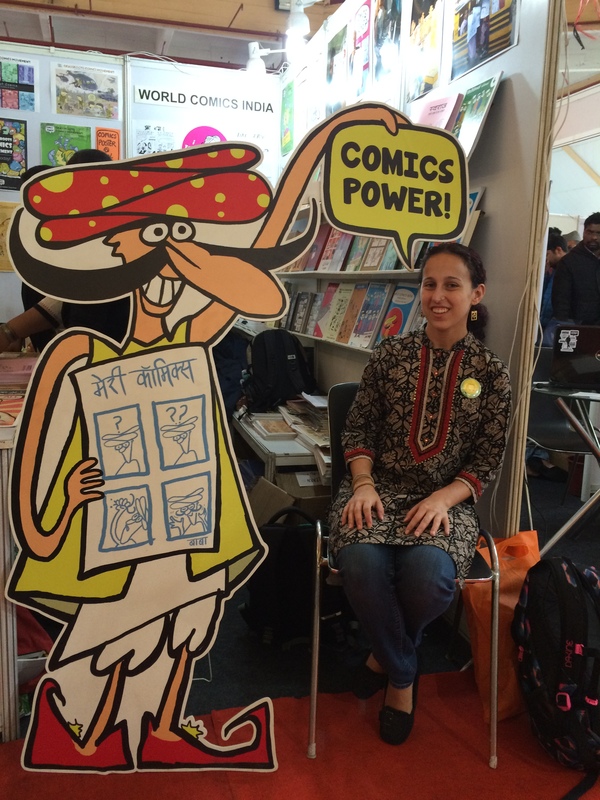 Mara Thacker at the World Comics India booth at the book fair in New Delhi. The orange bag behind my chair is full of purchases to send back to the library! Typically, the budget to purchase materials on a buying trip is the same as a subject specialist’s regular collections budget. However, on this last trip, the Center for South Asian and Middle Eastern Studies (CSAMES) had written into a grant proposal some funding to acquire language learning materials for South Asian languages including Hindi, Urdu, Sanskrit and Bengali. Altogether I budgeted around $6000 for materials purchases and shipping, half of which was from the CSAMES grant and the other half of which came from my regular collections budget. How do you get the items safely back to the States? I usually allocate roughly 30% of my budget for shipping the items back. International shipping can be complicated, so, on my last buying trip, I had one major vendor, D.K. Agencies, as well as the Library of Congress offices in Dhaka and Delhi office help. I carried back a few items in my luggage, but for the most part I try to avoid that so I can travel light as I’m moving between several cities in a short amount of time. Are there any obstacles or difficulties the layperson might not know about in regard to buying trips? Of course there are predictable challenges like paying for things in an economy where credit cards aren’t always accepted, spotty wifi connections, and the fear of a major digestive incident. Then there are less predictable things like political demonstrations, transportation strikes, and run-ins with street animals. True story: On my first ever buying trip, I got bitten by a street dog and had to get a rabies treatment in an Indian hospital! One challenge that may be surprising to our readers is that finding a balance between work and pleasure while on these trips is a challenge. At home, we usually work 40 hours a week and have time off on the weekends, but when on a buying trip, one is constantly aware that the university is paying a good deal of expenses to support the trip and there is a self-imposed pressure to always be on duty. Fortunately, being in India is a treat and the locale made the work activities extra fun. Attending a literature festival or book fair is probably something I would choose to do in my spare time anyway because I’m a bibliophile. But, I did do a few personal things for myself while there. For example, in Bengaluru, my friend Kunal took me on a vintage motorcycle ride to see the largest air show in Asia and I spent a few hours one evening trying to track down a restaurant called Gulati’s that I was told had some of the best butter chicken in India! Outside of those adventures, I worked over 40 hours a week because after a full day of visiting shops, publishers, and vendors, I would continue checking catalogs, respond to emails, take documentation of the day’s activities and purchases, and plan the next day’s schedule. 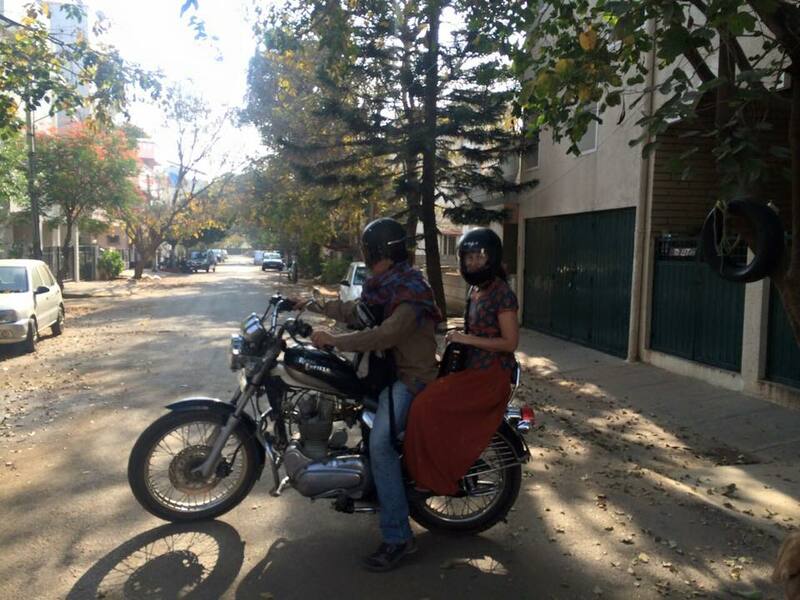 Headed out to the air show with Kunal on a vintage Royal Enfield motorcycle! I was really set on returning to Bangladesh but as the security situation there grows steadily worse, including three murders of secular bloggers in less than a year, I’m not sure if it will be possible in the immediate future. I’d like to visit Sri Lanka because I’ve never been and I’d like to get some Sri Lankan comics for the collection and make contacts there. I’d also like to go to South India which is one of my favorite places on earth and also happens to have some major popular culture production . Including these places would make for a compelling buying trip application because they would expand my network into other South Asian countries, and therefore expand my reach in the services I can provide to students looking to do research in South Asia. The comic collection is also an important collection both in terms of contributing to the national collection and also just in terms of distinguishing our local collection, so targeting places to get unique acquisitions for that collection is helpful. How can U of I community members find out more about library workers’ buying trips? Though buying trips are just a small fraction of the international work done by UIUC librarians, they are included in this map we have been developing that shows where all our librarians have traveled for work. My recent buying trip to South Asia is included as well as my colleagues’ buying trips to Togo, China, and Cuba. 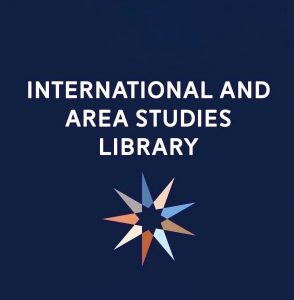 The public can also find out more about these trips by following the International and Area Studies (IAS) Library’s Facebook page and Glocal Notes blog. There will also be a library exhibit next fall about these trips to be announced on our social media accounts. If you want to read more about my last trip, see the forthcoming column in the journal International Information & Library Review. We’ll be sure to share link once it is live. "Glocal" comes from the term "glocalization," which comes to us by way of Japan from the term "dochakuka" (土着化). In Japanese it means the process of indiginization but also the blending of global and local or cultural hybridity. The term focuses on the particularism of global phenomena and is thus a blend of international and area studies.